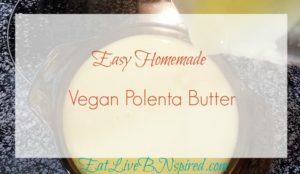 Enjoy Homemade Vegan Polenta Butter that’s oil-free, dairy-free, nut-free, soy-free and gluten-free. Quick and easy only 4 ingredients. Spread smooth creamy vegan butter on toast, baked potatoes even on Portuguese Sweet Bread. I reach for the butter knife as two slices of bread pop-up from the toaster. And the smell of warm toasted bread fills the air. Growing-up my mom baked homemade bread and Portuguese Sweet Bread. At times, I can still smell the scent of bread baking. Anticipation grew as my siblings and I waited impatiently for the bread to finish. Before mom had time to wrap the bread in a cloth, we grabbed it away. Piping hot, burning our hands, we pounced on it like a pack of wolves. Before you knew it half had disappeared. The butter melted as it touched the fresh baked bread. Ooh, does it get better than that? So many recipes include butter. It’s in everything. In every day cooking, baking, sauteing even as a condiment at the dinner table. The main ingredient in “regular” butter is dairy. And it doesn’t go bad when left “forever” on the counter! Don’t even get me started on margarine, butter is the “healthier” of the two. 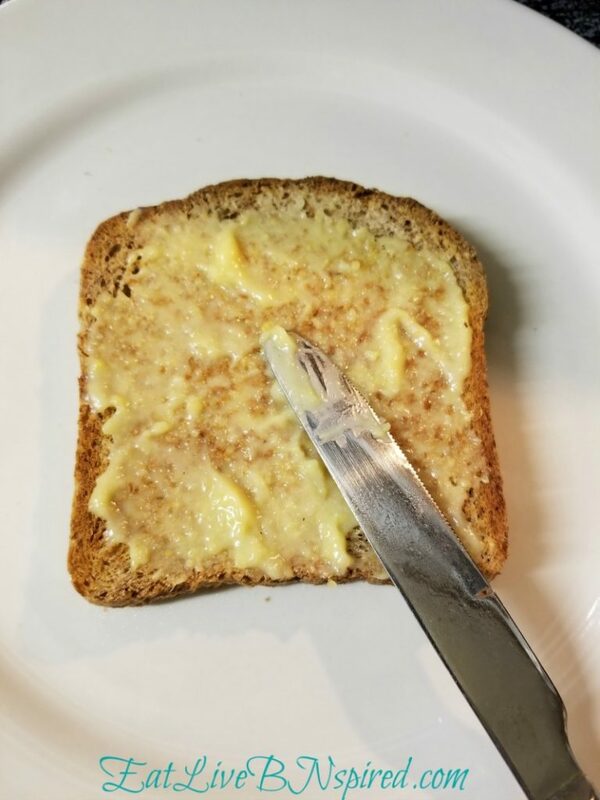 Spreading butter on warm bread was the norm for so long. 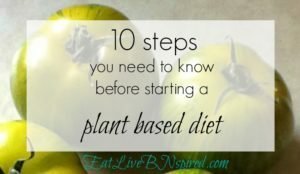 But since transitioning to a whole food plant-based diet, dairy hasn’t been on the menu or a part of my day to day diet. For this girl butter has disappeared along with all the weight. I came across Dr. McDougalls October 2006 newsletter. Mary McDougall published a recipe for Corn Butter. I tried the corn butter, but for me something was missing. About the same time, I discovered a new savory whole food grain called Polenta (Corn Grits). A coarsely ground cornmeal with a yellowish color. The yellowish color reminded me of butter. So with Mary’s recipe as a guide, I substituted Polenta for cornmeal and created Vegan Polenta Butter. Now butter is back on the dinner table! ….One of these days Portuguese Sweet Bread will be too! Bring saucepan to a boil. Once ingredients start to boil reduce heat to low. Continue to whisk for 5 minutes. Homemade creamy vegan polenta butter. 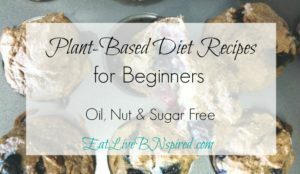 Oil-free, dairy-free, nut-free, soy-free and gluten-free. 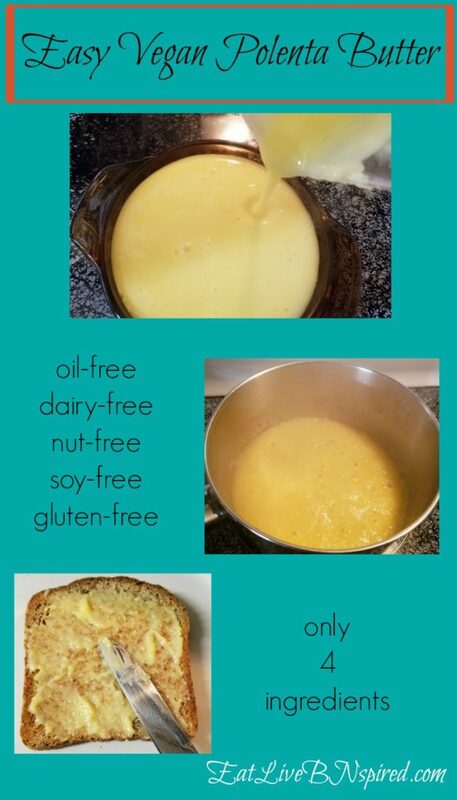 Quick and easy only 4 ingredients. Grind polenta on high in a high-speed blender or coffee grinder. Grind/blend into a fine powder. With a whisk slowly add cold water to the ground polenta. Stir until all lumps are gone. Bring saucepan to a boil. Once ingredients start to boil reduce heat to low. Continue to whisk for 5 minutes. Be careful while stirring, as the polenta will bubble up while cooking. Remove pan from the heat after cooking for 5 minutes. Add salt, lemon and polenta mixture in a high-speed blender. Blend on high until smooth. Be careful as ingredients will be hot. Pin the Recipe for later, of course! Click the Like button below and share with a friend, if you enjoy this recipe! What items have you given up but miss at times? Let’s chat in the comments below! This looks interesting! I can’t wait to try it! Thanks! Hi Maria! This sounds delightful, I can’t wait to give it a try. I love the versatility of cooking with polenta and knowing it can serve yet another purpose is exciting! I was just wondering, how long will this keep in the refrigerator? I’ve keep my leftover about 5 days before. Make sure to not cross contaminate your spoon or lick the spoon then dip it back in. That will make it last less time. Can you use this as a replacement to oil/butter in recipes? I have not tried is as a replacement in a recipe yet. I plan on testing it out on air popped popcorn. I made this today and look forward to trying it out on various items. 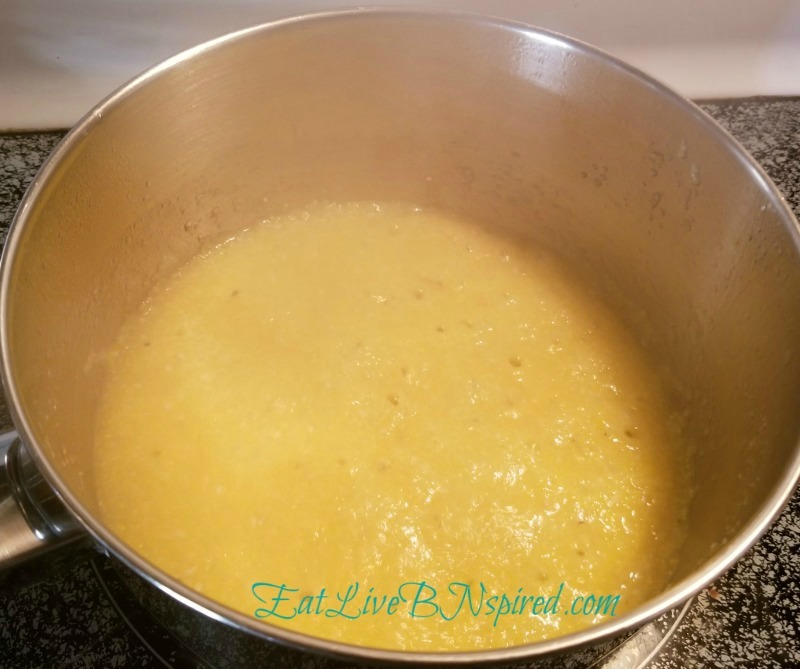 I used about 1.5 tsp of lemon juice and will probably use only 1 tsp. next time. I also added 1 tsp. 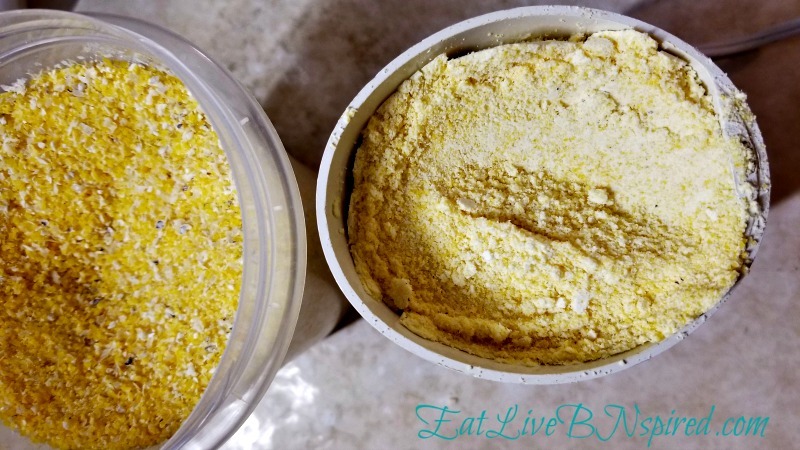 of nutritional yeast. It would make a great sauce over steamed vegetables! Thanks for trying it out. I will try adding the NY next time. Thanks for the suggestion! I’m so happy you like the Polenta Butter! It’s amazing how many wonderful things we can eat. 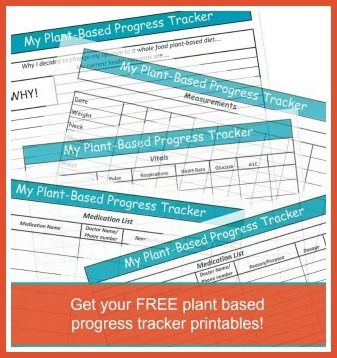 I’m excited that your daughter and granddaughter are eating plant based! You are all going to be healthy together. Great recipe thank you. I added a shake (or two!) of nutritional yeast which helped it immensely. 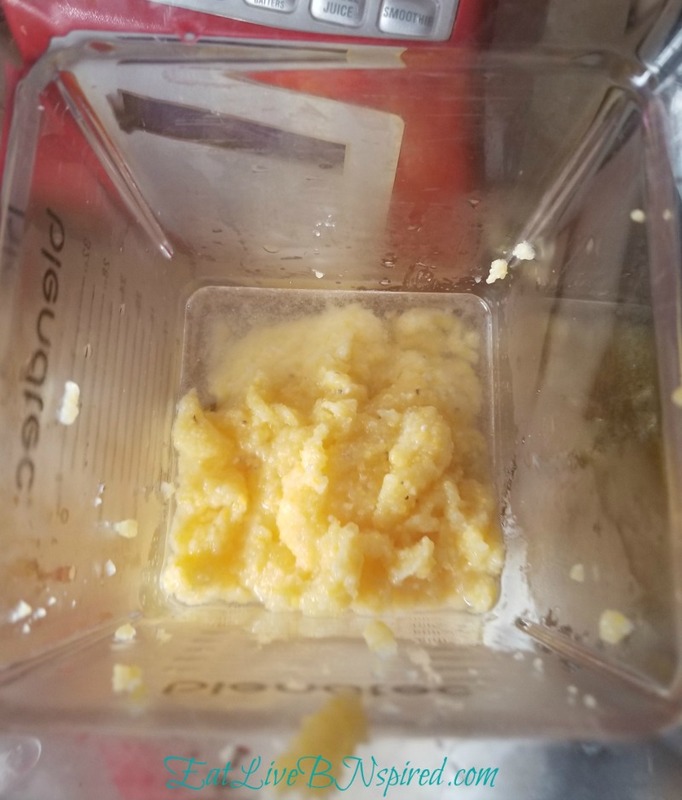 Don’t know if anyone has tried the cauliflower/plant milk/psyllium husk “butter” recipe, but this polenta one is much nicer than that. Huge congratulations on your major “then and now” transformation too! 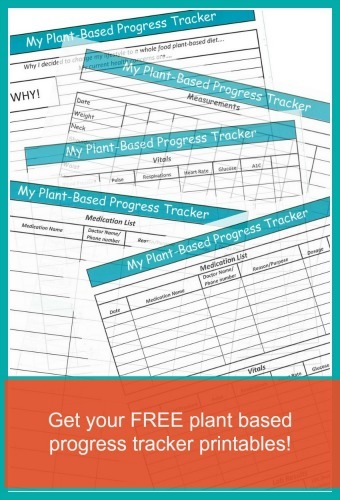 I can’t believe how easy it has been for my husband and I to embrace the WFPB regime – it is such a wonderful way to live and eat. We too have had incredible weight loss and enjoy feeling so well. I need to try adding NY. I haven’t heard about the cauliflower “butter” before. Congratulations on you and your husband going WFPBD! That’s wonderful! It’s been an enjoyable journey. I’m glad I gave WFPBD a try. I will have to check out Anja’s recipe. Let me know what you think about the Polenta Butter. Curious to know if the pre packaged polenta I’ve seen in the tubes would work just as well as the dry polenta. As a mother of a toddler I don’t have much time on my hands but would lo e to try whipping this up someday. It looks super tasty and I’m sure the kiddo would love it too. I’ve never tried the pre-packaged polenta. I don’t know how that would turn out. I would recommend using the whole grain polenta. When cooking the polenta you would be fine stepping away from the stove for a few minutes. just lower the temperature a little. When it’s first made it’s creamy and soft. And thickens when it cools then thins out when it’s warmed up again. I would love to hear how it turns out in your cinnamon rolls. Could this be used on popcorn? Air popped? So far I have not been successful in putting it on popcorn. 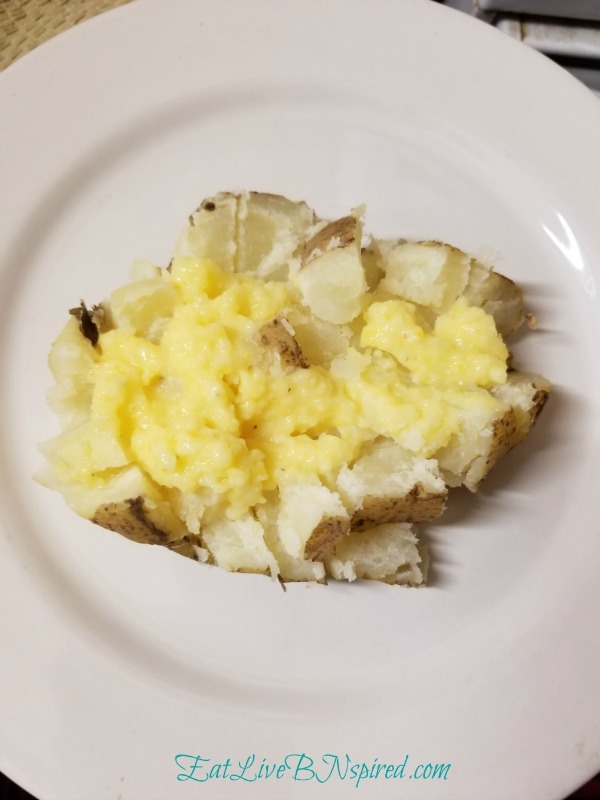 I’ve tried the cauliflower and physilliun husk recipe and whilst I love cauliflower, I thought it was gross but this, this one right here is gold. I omitted the lemon juice and I added salt to taste but it was perfect. The consistency, I thought, if it melts down again when reheated, would be great for doing a ‘cheese’ recipe to be melted on toasted. But anyways, this was delicious and perfect. Sick of all the vegan foods being so unhealthy, out there! Thank you! Would cornmeal work instead of polenta? No, It doesn’t turn out the same as using Polenta.